Read pricing, features, and a review for the Lorex 4K Ultra HD IP NVR Security Camera System with 6 IP-Cameras. The Lorex 4K Ultra HD IP NVR Security Camera System with 6 IP-Cameras is a security camera system from Lorex. It boasts a night vision range of 200 ft. and a 2TB hard drive. 4K NVR can support up to 8 cameras. 200 ft. night vision range. Pros: Great picture quality and reasonably priced. Cons: Might be outside the price range of a small business. Bottomline: A well-made camera system with a wide array of features. What are some alternatives to the Lorex 4K Ultra HD IP NVR Security Camera System with 6 IP-Cameras? Cromorc All in one with Monitor Wireless Security Camera System. 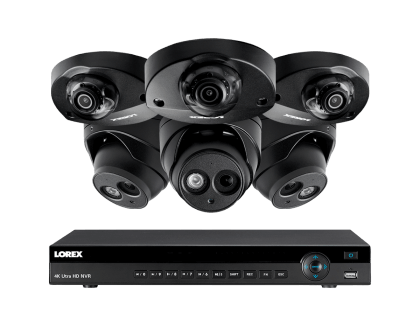 Where can I buy the Lorex 4K Ultra HD IP NVR Security Camera System with 6 IP-Cameras? The Lorex 4K Ultra HD IP NVR Security Camera System with 6 IP-Cameras is available on Amazon and on the Lorex website. Does the Lorex 4K Ultra HD IP NVR Security Camera System with 6 IP-Cameras work at night? Yes, the camera has a maximum range of 200 ft. at night. Can the Lorex 4K Ultra HD IP NVR Security Camera System with 6 IP-Cameras be used in any weather? Yes, the cameras have an IP67 weatherproof rating, which means they are suitable for both indoor and outdoor usage.